Originally debuting as a fun concept vehicle at the 2005 North American International Auto Show, the Toyota FJ Cruiser has grown over the years into a surprisingly popular vehicle. In fact, total sales of the vehicle are now well over 200,000. Much of this success stems from Toyota’s willingness at the time to go against the conservative grain and produce a capable off-road vehicle. That’s right: a Japanese automaker made a strong off-road vehicle!!! “The FJ Concept differed dramatically from other Toyota show cars,” said Toyota chief engineer Akio Nishimura in an interview with Car and Driver. 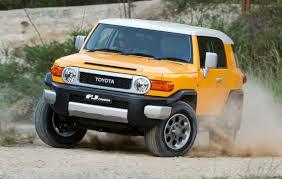 Now, after eight years of production, Toyota is finally ready to hang up the FJ for good at the end of 2014. This decision, of course, was spurred along by dwindling sales (a drop from nearly 60,000 per year in 2006 to a meager 13,000 just last year) that forced the company to take the axe out, instead of take a shot at a solid re-design. As part of a farewell tour, though, Toyota has been producing a special Ultimate Edition of the vehicle, each outfitted with Heritage Blue paint and a white grille that is a direct reference of the FJ40 glory days. “[This special FJ] pays tribute to the iconic Land Cruiser FJ40 of the 1960’s, from which the FJ Cruiser draws its rugged DNA, inspiration and design,” says Toyota. 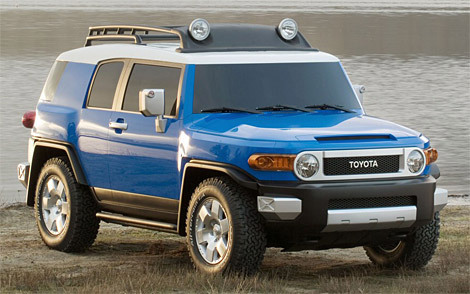 So, the real question for all you gear heads out there is: will you miss the FJ Cruiser or are you happy to see it go? This entry was posted in Culture, Toyota and tagged end, fj cruiser, Toyota. Bookmark the permalink.